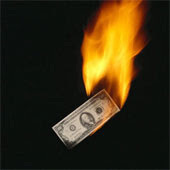 ECONOMIC COLLAPSE BLOG: The death of the dollar? interrogation surrounding the faith of the dollar have increased dramatically after the spectacular arrest of two Asian citizens last week trying to smuggle $134bn in US state bonds from Italy to Switzerland at the Monte Chiasso border , Switzerland is very known amongst investors and tax invaders for being a tax haven with a very strict banking secrecy ...The British paper The Telegraph is wondering if the Dollar is Dead and have published an article entitled " Is this the death of the dollar? " This should not come as a surprise. These events happen in light of the use of FIAT currency. But I hope the dollar will not totally collapse by imposing as soon as possible sound monetary policies, and going to a pure gold standard.